These components can come in a few different types, but your garage door is most likely using either the torsion or extension types. Whichever type your door uses, when these components snap they can become quite a safety hazard. Even if you have safety cables in place, a damaged spring can be dangerous for your family and property. Calling our professional team is the quickest and safest way to get your issue fixed without exposing yourself to injury. 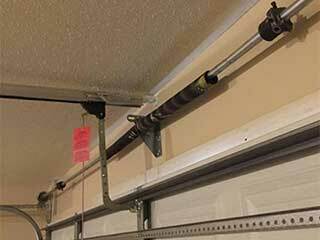 Out of all the common household garage door springs, the torsion type are the more industrial option. These components are located right above the opening of your garage, and you can even see them twisting under a great deal of tension as your door moves. The force that gets generated when this happens is immense, which makes any problem with these components potentially very dangerous. Having an expert inspect them on a regular basis is a good idea. You can tell this type apart from its torsion-based cousin by the fact that these springs are long, and are found suspended between two brackets. Hopefully, you already have safety cables installed to mitigate the safety hazard that would result if one of them was to snap. The cable and pulley system that generates the necessary tension to lift your door is sufficiently complex that you would be well-advised to call a professional to handle any related problems. Although it can be tempting to try and repair or replace your garage door springs without the involvement of a qualified technician, it’s highly inadvisable. You would be surprised at how heavy these components can be, not to mention the weight of the door itself. Torsion springs are especially dangerous to handle, given that you need to control the tension manually as you unwind them. It is always better to be safe than sorry, so get in touch with our Garage Door Repair Buford professionals to handle any problem for you.